Pictured below is a cast iron corn sheller that has worked well for us in shelling (taking the kernels off the cob) corn for small plot field research. Weighing the kernels on the cob could give misleading results because sometimes the cob isn’t completely filled with kernels due to incomplete pollination. 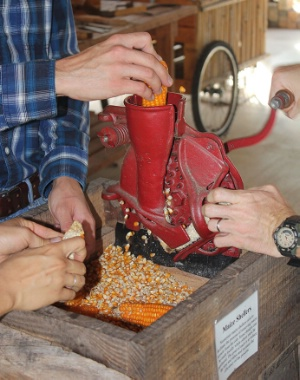 Taking the kernels off the cob allows for weighing the final harvested product without the cobs. At close to $300, it isn’t cheap, so probably not practical for many individuals. If any readers have other suggestions as to other methods, those are welcome. There are other models of these sold by other companies as well, including a hand sheller. In the picture above, we are shelling ears of corn that were allowed to dry on the plants in the field.